In this post, we continue our portraits of resident ensembles featured at this year’s June in Buffalo with Ensemble Signal. A chamber ensemble of flexible instrumentation, the group was founded in 2008. A “new music dream team” (Time Out New York) of new music specialists, many of them highly regarded soloists in their own right, the group has rapidly ascended through the ranks of the new music world to appear at prestigious venues such as the Lincoln Center Festival, BIG EARS Festival, Carnegie Hall’s Zankel Hall, Tanglewood Music Festival of Contemporary Music, Ojai Music Festival, Miller Theatre, (le) Poisson Rouge, Cleveland Museum of Art, the Wordless Music Series, and the Bang on a Can Marathon. 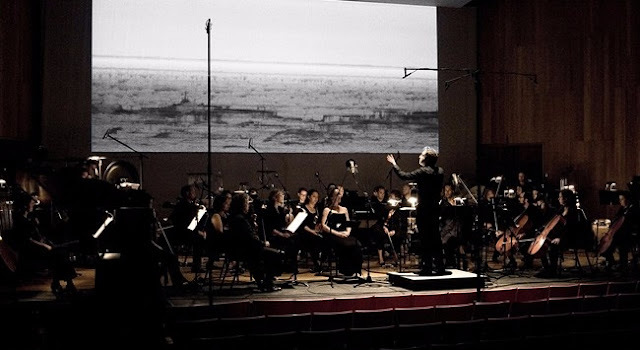 Signal has collaborated with leading artists such as Steve Reich, Helmut Lachenmann, Irvine Arditti, Kristian Bezuidenhout, Michael Gordon, David Lang, Julia Wolfe, Oliver Knussen, Hilda Paredes, and Charles Wuorinen, and has recorded for Cantaloupe, Harmonia Mundi, Mode, Orange Mountain, and New Amsterdam Records. The Center for 21st Century Music has contributed to Signal’s success via its long-term partnership with the ensemble. The group has been a resident ensemble at June in Buffalo each year since 2010, and has also been invited to the Center for appearances on its visiting artist series during the academic year. The group’s flexibility has been an asset here, enabling occasional presentation of rarely presented extended works for large ensembles, such as Steve Reich’s Music for 18 Musicians (in 2017) Sextet and Double Sextet (2012), Center artistic director David Felder’s Les Quatre Temps Cardinaux (2015), and Louis Andriessen’s La Passione (2012). Most recently, the group appeared at the Center for another ambitious programming venture, a portrait concert of the demanding, detail-oriented music of acclaimed American composer Charles Wuorinen in late April. At this year’s festival, Signal will present two concerts: one featuring works by participant composers, and another with works by senior composers: Hilda Paredes’s Chaczibzib for solo piccolo, Roger Reynolds' Positings for flute, horn, piano, violin, cello, and electronics, and David Felder’s Jeu de Tarot for violin and ensemble. At last year’s June in Buffalo, Signal gave a preview of select movements from Felder’s piece; Ensemble Linea premiered it during their November residency at the Center. In all of these performances, the guest violin soloist has been Irvine Arditti, who collaborated closely with David Felder in the creation of the solo violin part. Signal has continually astounded Buffalo audiences with their high level of execution on even the most ambitious, demanding projects, so we greatly look forward to their return visit in June!